I picked up Truly Devious at the beginning of 2018 and put it on hold pretty quickly. I was not in the mood at all and the story was falling incredibly flat for me. However, I decided to pick up the audiobook while I travelled to work. Thankfully, that format had me loving this story. I was completely taken aback by the story and the fact that I was incredibly in to the mystery. I accidentally spoiled myself for the ending by reading the blurb of book two (don’t do that guys) so that is probably one of my only disappointments. This was actually my first Maureen Johnson boo. I hear that people absolutely adore her books so I am glad I am able to join that list when it comes to enjoying her books. I don’t know if I’ll read any more, but we’ll see if anything catches my eye. Truly Devious follows Stevie Bell, a true crime fanatic. She is shunned at her school and viewed as an outcast so when the Ellingham Academy reopens she puts her application in as a joke. She isn’t spectacular in any way. Not like some of the kids who attend. Nor is she rich. However, when she gets accepted she is ecstatic. A group of kids who hopefully won’t look at her like she is strange. An escape from her parents too. They support a politician she absolutely despises and does not want anything to do with being home. Stevie also wants to solve the Ellingham mystery. Two people murdered, a student and Ellingham’s wife, and one missing, Ellingham’s daughter. A mystery that has never been solved despite the fact someone was found guilty. The missing answers trap Stevie so completely that when one of her classmates die she is sure they are connected. She is desperate to get to the bottom of it. I also want to briefly mention you will not find out the answer to the Ellingham mystery in this book. I feel that this will be something that is solved in the final book, with lots of build up. The mystery element in this book was definitely the most interesting part. Obviously. We experience the current mystery, the death of one of Stevie’s classmates, and the Ellingham mystery in a dual sort of perspectives. Flashbacks to original mystery and interviews are included throughout the book. They really set an atmosphere that alluded to the mystery. I think the biggest part of this book that was well done was the anxiety representation. Stevie Bell suffers from panic attacks and at one point even knocks herself out to avoid one. Iconic. She is also ruthless as heck and despite her anxiety, never lets it hold her back from researching her mystery. I did have some problems with her character – mainly how she treated her parents and I really didn’t understand why people thought she was weird for loving true crime. The romance in this book was absolutely steamy as well. It is not as if anything risqué happens but the chemistry between Stevie and the other character. At the beginning of the book I thought the love interest was going to be someone else, I was definitely not prepared for who it actually was. 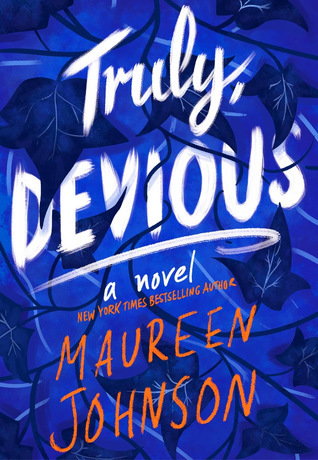 Overall, Truly Devious is a mystery novel that truly does leave you wanting more. The mystery of the Ellingham murder is absolutely enchanting and I found myself wishing I could increase my audiobook speed past 2x to get through the story faster. I am disappointed that the mystery wasn’t solved in this book but it honestly just makes me have grabby hands for the second book. Great review, although massive bummer on accidentally spoiling yourself! I really enjoyed this book and can’t wait for Vanishing Stair! Thank you so much Kaleena! I’m glad you also enjoyed this one!